NEARLY FIVE CENTURIES ago, the Polish astronomer Nicholas Copernicus went public with one of the most important arguments ever made in the history of ideas. The earth did not sit immobile at the center of the universe, he wrote. It revolved around the sun. It was the mother of all paradigm shifts, dismantling a model of the universe that had been dogma since antiquity. When he published his theory, in “On the Revolutions of the Heavenly Spheres” (1543), Copernicus provided a wealth of data on the movements of celestial bodies in support of his case. But what’s often overlooked is that he began his argument from the ground up, by focusing not on the heavens but the earth. In particular, he began with a geographical revelation, prompted by something he had recently come across on a new map. Known today as the Waldseemüller map of 1507, it was the first to depict the lands discovered by Columbus and other early explorers as part of a vast and previously unknown continent. Earlier maps had shown the new discoveries only vaguely, as a still-to-be-determined part of Asia, but this new map boldly located them far out in the western ocean, on the other side of the globe from the known world, extending deep into the southern hemisphere. And it gave this place a memorable new name: America. The story of how a map of the world helped Copernicus to rethink the universe is rarely told. But the connection tells us something important about how great ideas are born. To understand it, we need to recall that medieval scholars didn’t consider geography and astronomy to be distinct disciplines. Instead, they considered them parts of a single field called cosmography - the study of the known world and its place in the cosmos. One of the field’s guiding principles went something like this: Looking down, we see up; looking up, we see down. By carefully studying the earth, cosmographers believed they could learn about the heavens, and by carefully studying the heavens they believed they could learn about the earth. Copernicus himself was a cosmographer, and shared this view. We remember Copernicus as one of the first great thinkers of the modern scientific era, but he inhabited a profoundly medieval thought-world - a world in which astrology and alchemy commanded as much attention as geography and astronomy. For all its obvious and sometimes laughable shortcomings, the medieval approach to learning was far more integrated than our own, and it allowed Copernicus to think on a truly grand scale. From a cosmic vantage point he looked down, at a map, and what he saw made the skies open up. WHEN CHRISTOPHER COLUMBUS first sailed west from Spain in 1492 in search of the Indies, nobody worried that he would sail off the edge of the earth. Medieval Europeans knew full well that the world was a sphere, and that if you sailed far enough to the west you would arrive in the east. In that sense, they understood the shape of the world. But when they set their sights beyond the earth, they still relied on a 2,500-year-old model of the universe, one that scholastics during the Middle Ages had made fundamental to Christian theology. According to teachings that dated to Aristotle, the cosmos as a whole consisted of a set of concentric spheres. At the center was the earth, a solid ball of land. Surrounding the earth, successively, were spheres of water, air, and fire; then individual spheres for the moon, the sun, and the planets; and finally, at the outer limits, a single sphere studded with stars, beyond which lay a realm of pure abstraction, or God. Each of these celestial spheres rotated around the earth at its own pace. This model did a serviceable job of explaining the apparent motions of the heavens, but it had a fundamental problem. If the cosmos did indeed consist of a set of spheres with the earth at its center, then why wasn’t the earth completely submerged in the sphere of water that surrounded it? Why was there any exposed land at all? European scholars in the late Middle Ages devised a way of explaining this problem away. The earth, they suggested, bobbed slightly off-center in the sphere of water, “like an apple in a basin,” as one writer put it in 1484. How had this happened? God had simply made it so. The Book of Genesis told the story: “And God said, Let the waters under the heaven be gathered together unto one place, and let the dry land appear.” In practical terms, scholars explained, what God had done in working this miracle was to push the sphere of the earth to one side of the sphere of the water, exposing part of it to the air and creating the contiguous lands that would come to be known as Asia, Europe, and Africa. But Copernicus went on to add that he had recently come across even more compelling evidence against this theory. And this evidence can only have come from the Waldseemüller map. The map was the work of Martin Waldseemüller, a German humanist based in the town of Saint-Die, in the mountains of eastern France. It was this obscure figure, now almost completely forgotten, who first mapped the world roughly as we know it today. Waldseemüller’s map was huge, measuring 4½ feet by 8 feet. Probably no printed map had ever been larger. Waldseemüller would later claim that he printed 1,000 copies of the map, but only one survives today, discovered by accident in a German castle in 1901, and bought in 2003 by the Library of Congress for $10 million, the highest price ever paid publicly for a historical document. Copies of the map seem to have circulated widely in the early 16th century. In the years immediately after 1507, it reached a number of German university towns, where professors probably used it as a classroom prop. By 1512, it had made it to Poland, where Jan de Stobnicza, a professor of philosophy at the University of Krakow, published his own partial copy. Nobody who saw the map could miss what dominated its left side. Rising majestically out of the western ocean, extending deep into the southern hemisphere, was a huge new continent. And printed across the region we now know as Brazil was a strange new name: America. Why Vespucci and not Columbus? Columbus had restricted his explorations to the Caribbean, which, he insisted until his dying day, corresponded to a region already visible on maps of the Far East. Vespucci, on the other hand, had done something much more dramatic. He had sailed south, following the coastlines of the New World far below the equator into a part of the world never mapped before. Waldseemüller decided to make his map after reading letters by Vespucci and seeing sailors’ charts containing sketches of the newly discovered coasts. It was the southness, not the westness, of the New World that made him, like other Europeans, feel that something remarkable had been discovered across the Atlantic. The logical thing for Waldseemüller to do would have been to depict these new coasts as a part of Asia, or at least as nothing more than terra incognita. But instead he decided that what Vespucci had discovered had to be an entirely new continent. 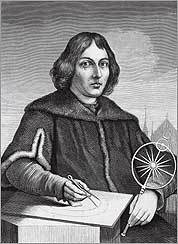 At the time Copernicus came across the Waldseemüller map, he had already begun to look for evidence that would support his new theory of the cosmos. And when he saw America on the map, he knew he had found what he was looking for. The location of this new continent, he realized, disproved the theory of the off-center earth. If the earth really did bulge out of one side of the sphere of water, he reasoned, then the ocean had to get deeper and deeper the farther one sailed away from the shores of the known world. Land, in other words, could not protrude from opposite sides of the sphere of water. And yet that’s exactly what Copernicus saw happening on the Waldseemüller map. Here was a giant southern continent far off in the western ocean, located diametrically opposite to the known world. Quite suddenly, at its very core, the old model of the cosmos was falling apart. If the theory of an off-center earth was directly at odds with geographical reality, as the Waldseemüller map showed it to be, then the time had come, it seemed to Copernicus, to think about the cosmos from an entirely different perspective. In the preface to On the Revolutions, he mentioned having begun the book long before its 1543 publication, and having kept some version of it buried among his papers for “the fourth period of nine years.” The phrase is convoluted, but the math is simple. Four periods of nine years is 36 years, and 36 years before 1543 is 1507 - the year the Waldseemüller map appeared in print. It’s easy to see how Copernicus could have had access to the map, too; he was in Poland during that period, visiting and corresponding with colleagues at the University of Krakow, where the map appeared no later than 1512. Most convincing of all, however, is that in the opening section of On the Revolutions he describes the earth using language that corresponds directly to what appears on the Waldseemüller map. His description of America, in particular, corresponds so precisely, in language and cartographical detail, that no other source appears possible. As a cosmographer steeped in medieval ideas, Copernicus found his way easily to the idea that studying the makeup of the earth might help him discern the makeup of the universe. Today scientific learning is vastly more specialized, and few thinkers dare leap so boldly between the tiny to the cosmic; there are just too many disciplinary borders to cross along the way. But precisely that kind of leap is what gives rise to great discoveries, which almost never can be contained within any one discipline. One only has to think of Einstein for an illustration of this lesson. What helped him develop his grand theory of relativity - as the historian of science Peter Galison has explained in fascinating detail in “Einstein’s Clocks, Poincaré’s Maps” - was the time he spent early in his life as a patent clerk, studying the problem of how to synchronize clocks. Toby Lester is the author of “The Fourth Part of the World,’’ which tells the story of the Waldseemüller map and will be published in November. For an interactive version of the map, see www.tobylester.com.